Vincent van Gogh, The yellow house ('The street'), 1888. Oil on Canvas, 72x91.5 cm. Van Gogh Museum, Amsterdam (Vincent van Gogh Foundation). On 7 April, the Arles-based Fondation Vincent van Gogh opens in the expanded 15th-century mansion. 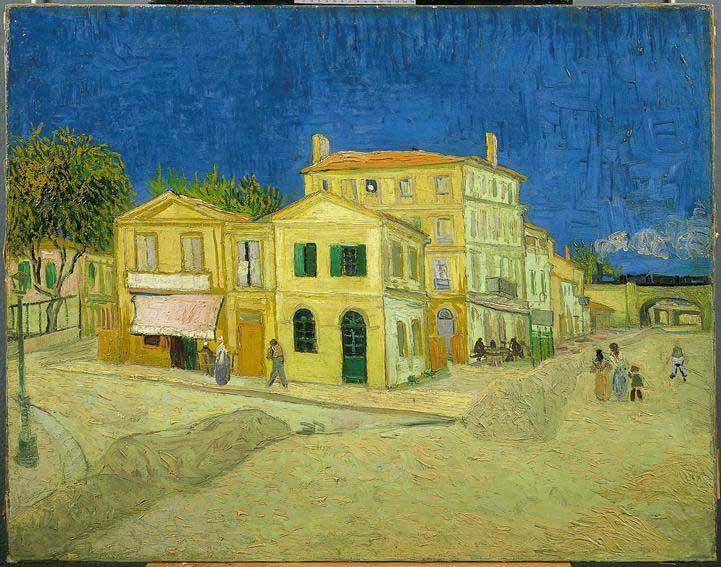 The town of Arles, where the artist produced his major works in barely fifteen months, will now be the regular host of presentations of Van Gogh originals. The Fondation Vincent van Gogh Arles received official state approval in 2010 and aims to showcase the Dutch master’s artistic heritage, while also asking questions about the resonance of his oeuvre in art today. The presentation of his paintings alongside works by contemporary artists stimulates a fruitful dialogue, centred on interrogation and reflection. It should allow us both to reflect and widen the view that we have of the past, but also of the future. ‘Van Gogh Live!’ is the title of the opening exhibition of the Fondation Vincent van Gogh Arles. On the one hand, it presents ‘Colours of the North, Colours of the South’, the first of a planned series of exhibitions about Van Gogh, curated by Sjraar van Heugten, and, on the other, it features contributions by Guillaume Bruère, Raphael Hefti, Thomas Hirschhorn, Gary Hume, Bethan Huws, Bertrand Lavier, Camille Henrot, Fritz Hauser and Elizabeth Peyton, who have been invited by Bice Curiger. The major theme of this first in a series of exhibitions devoted to Van Gogh, ‘Colours of the North, Colours of the South’, retraces the evolution of his palette from darkness towards southern brightness, and presents some of his works alongside those of his contemporaries who had a decisive influence on him: Courbet, Pissarro, Monet and Monticelli, among others. This exhibition includes nine pictures of Van Gogh and 21 by his contemporaries.